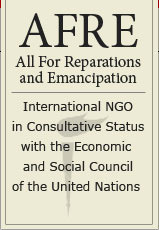 On this page AFRE offers the most current interventions of Silis Muhammad before the UN on Afro-descendants (descendants of enslaved Africans in the Americas Region and Slavery Diaspora.) The archive of past statements allows for examination of the arguments on the lingering effects of slavery, official UN recognition, restoration of human rights, and reparations. The work that Mr. Muhammad has undertaken on behalf of Afro-descendants at the United Nations is unprecedented and historic, and thus research and study are encouraged.